Dark-Readers: Holly Martin's One Hundred Proposals Chapter Two. 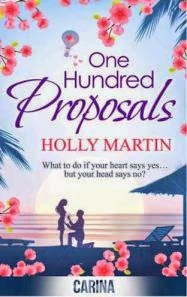 Holly Martin's One Hundred Proposals Chapter Two. Hello you lovely people, Hayley here I hope you enjoyed the treat that Holly gave us yesterday here is part two.. Dark Readers were honoured to be able to share this with you all and we look forward to reading and reviewing Holly's latest novel.